I love when people post food videos on Facebook. I regularly try a few - the ones that most catch my eye - and so far haven't been disappointed. One type of recipe I always have my eye out for is one offering a healthy salad, especially if I can make it into a full-meal-deal. Yesterday it was Almond Butter Thai Quinoa Salad. Honestly, I have a recipe - Crunchy Cashew Thai Quinoa Salad - that is similar already shared on my blog. The last time I served it to a friend they commented, "That salad changed my life." So it's a good one. But it never hurts to try other versions as over time, you'll often find yourself making little alterations to your favourite that makes it more your own and takes it to next level. 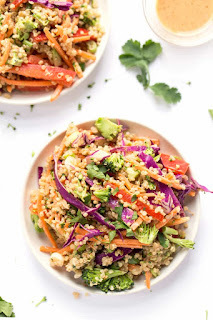 Almond Butter Thai Quinoa Salad will definitely be going on my menu list this week, in fact maybe tonight if I have everything in my refrigerator. I'll let you know how it turns out. Add all the salad ingredients into a large bowl, minus the broccoli and dressing. If desired, gently steam the broccoli for 2 minutes (or 40 seconds in the microwave) and transfer to the salad bowl. You can also leave it raw. Toss ingredients together to combine. Drizzle dressing over salad and toss again until everything is incorporated and evenly covered by the dressing. Serve immediately or store in fridge and serve when desired.